Location: Kalina Complex is located in the western part of Dolna Banya - a town just 12 km. away from the famous ski resort of Borovets and 75 km. away from the capital city of Sofia. The complex is easily accessible from Sofia via Trakia highway and the trip takes no more than 40 minutes. It is suitable to accommodate guests all year long. Accommodation: Kalina complex is located on 10 000 sq. m. and has 56 one-family houses, two swimming pools and 24 hour live security. The houses have a kitchen, living-room with a fire place, Cable TV, Internet access, two bedrooms with separate bathrooms. Sport & Entertainment: During the winter months the close proximity of Borovets offers great opportunity for ski tourism on the slopes of Rila Mountain while enjoying the peaceful atmosphere outside of the busy resort. 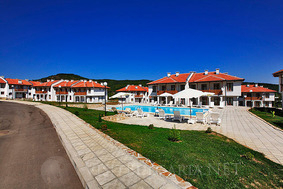 During the rest of the year Kalina Complex is a great place for family vacations, walks, swimming and horse riding. Dolna Banya Airport is a perfect place for those, who wishes to take flying courses by small single engine aircrafts. Golf: The new Dolna Banya Golf Center is in close proximity as well. Fresh mountain air, many opportunities for ski, spa & golf, great resort atmosphere - Kalina Complex in Dolna Banya can bring it all!